Microsoft Azure portal for Intune provide you the information about user sign-in activities (includes usage of managed applications) and Audit Logs (information about users ,group management ,your managed applications and directory activities) through reporting. On the right side ,you will see list of all users with their sign-in status for applications. On the top, you will see several filters like Date (Range from 1 month,7 days,24 hours and custom) ,User (user name or UPN name),Application (application name),client and Sign-in status (success,failure or all). You also have an option to download the results into CSV format. To see the audit logs ,while you are on users and groups- sign-ins ,click on Audit logs to see information about users ,group management. Audit logs also filter option to list the activities performed by specific user instead of seeing long results. As you can see from above snippet,there are several activities for user eswar koneti like change user license ,add owner to group,member to group,update user initiated by (actor) . This also gives you option to download the results into CSV file. I will need to see if this information can get from Power BI without going through Azure portal. Power BI for Microsoft Intune ,please refer http://eskonr.com/2017/09/power-bi-for-microsoft-intune/ . 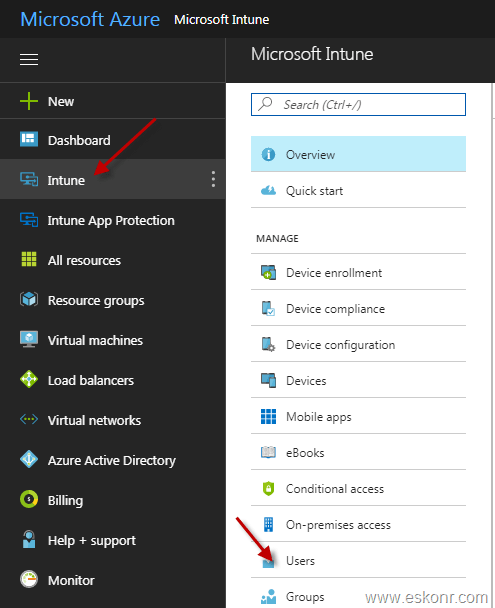 One Response to "How to check Sign-in and Audit activity reports in Azure Portal for Intune"
Apart from User and Group Audit activity , Intune now provides full auditing of all the operations initiated by a admin.